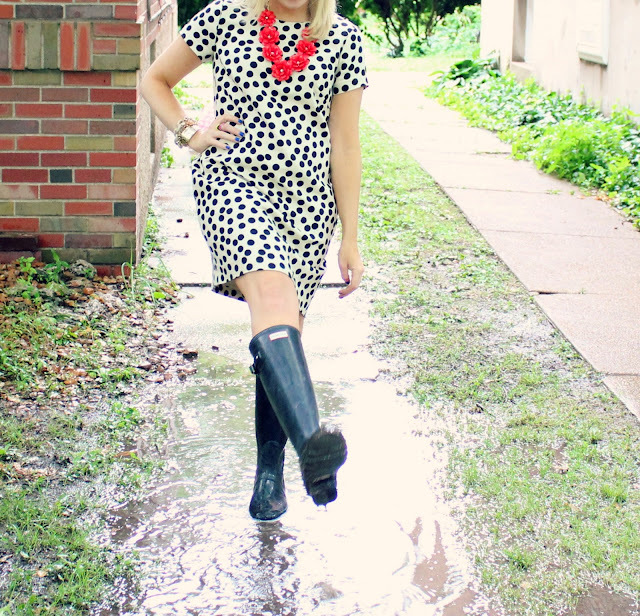 Stylin in St. Louis: Rain and Dots! Rainy weather calls for my rain boots! My hunter boots are perfect for the task! We have had so much rain lately! Every time is rains it cools down, so I guess I should not complain! Stay tuned tomorrow for an exciting giveaway! 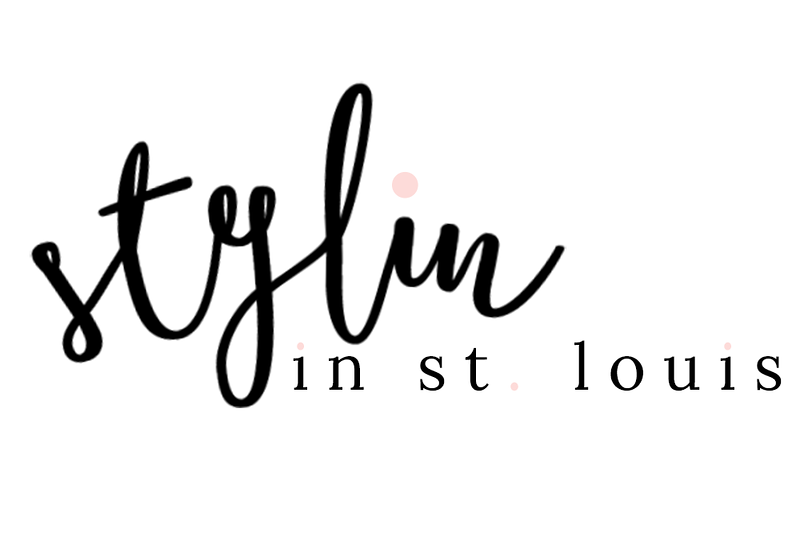 Follow me on instagram @jacquelinerendine or via Bloglovin! I have those Hunter boots! So fantastic :) Cute dress! Aren't they great?! These hunters boots were so worth it! I am so glad that I got them! Hello gorgeous! 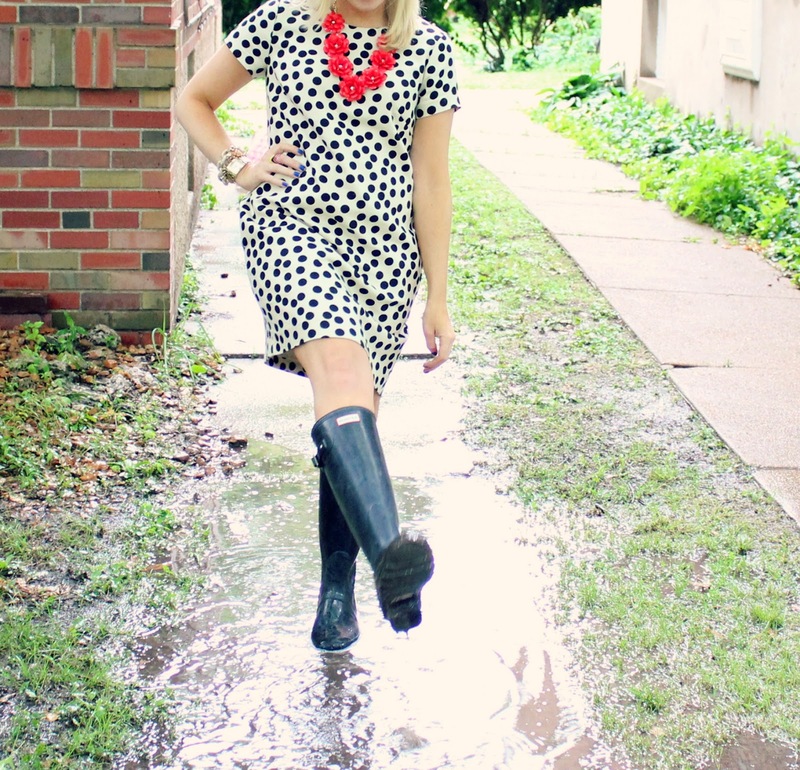 You make rainboots look so chic! I haven't had the money to buy a pair of Hunter's but when I do, I am probably going to get ones like yours! 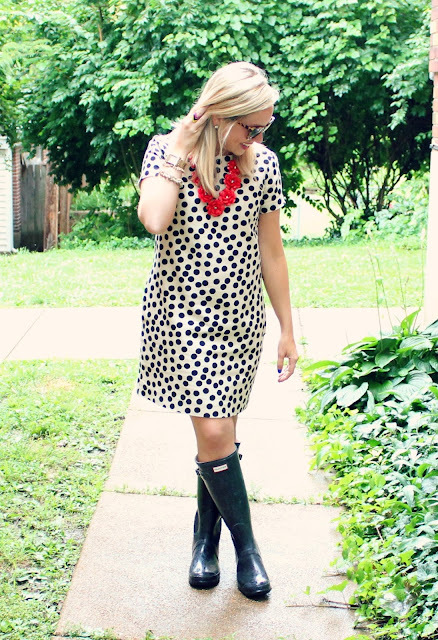 Hunter boots are great! They will be worth it! Thanks Meghan! I love new followers! Love your look in this post. You have great fashion ideas. Thank you! I appreciate your comments! They mean the world to me! 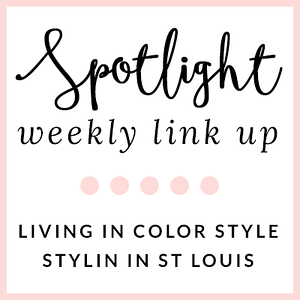 I found your blog through the group giveaway you're doing and I'm so glad I did! Loving this sweet polka-dot dress. Thank you for checking out my blog! I am so glad that you did! 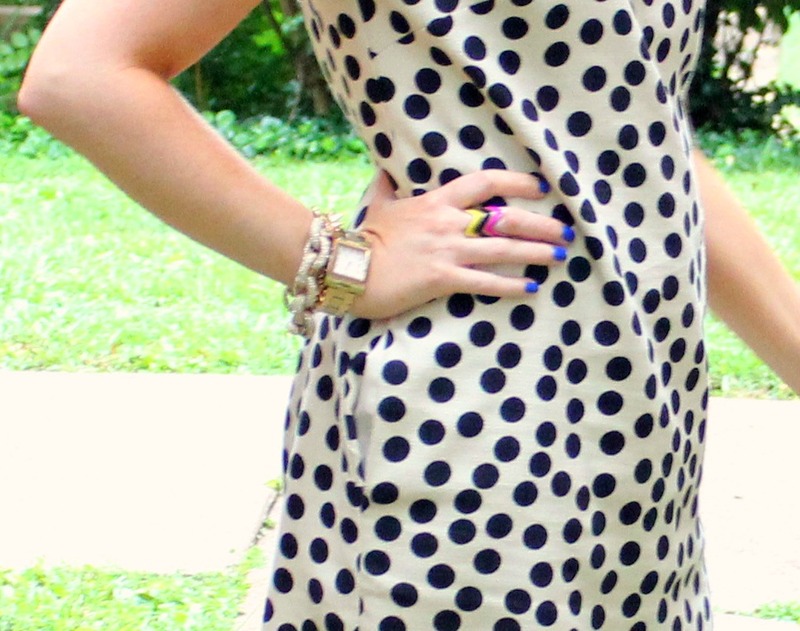 This dress is so fun and I was so lucky to find it. Someone returned it and I happened to be at the store at the right time. Love love this dress!! I wanted it SO bad but never did get it. Looks so adorable with the Hunters! I got some red Hunters a few months ago, and they are my favorite thing. I actually love it when it rains now! Hunters are so fun! I was trying to find PINK ones, but they were gone :(. So I decided to go with the black! They are so much fun to wear in the rain! This dress I got on a super sale and was lucky to find it. Someone returned it and it was calling my name on the sale rack! Love when that happens! You are too cute! 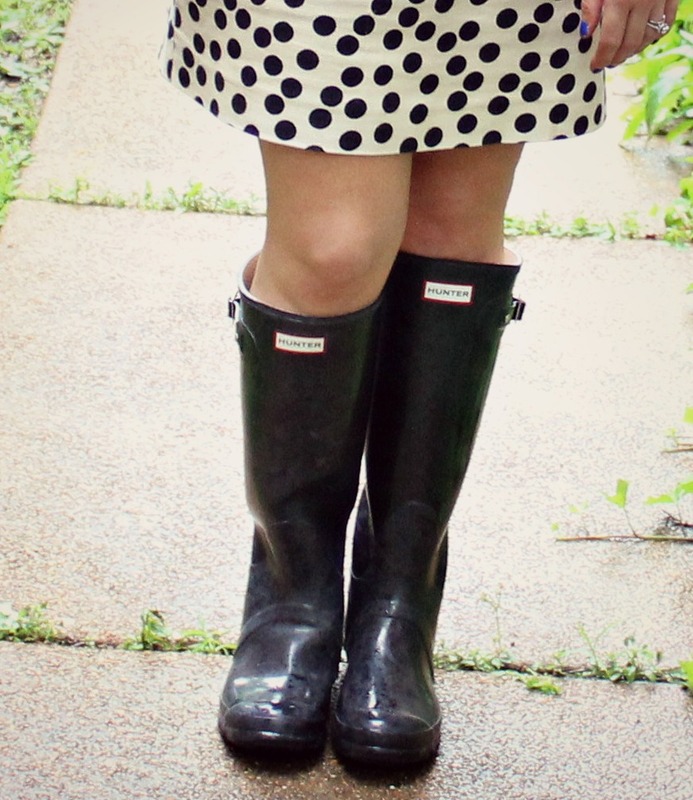 I love hunter boots, I feel like they go with everything. Glad to be collaborating with you, doll! Love the polka dots with the rosette necklace! It rains maybe an inch a year where I live in California so I could never justify the price of Hunters but they sure are cute. You look wondeful!!! love your necklace! I love your outfit, you look really yummy wearing your Hunter Wellies, i love them. If you want to look great even when it's raining outside, you really need a stylish pair of rain boots. Any old pair of rain boots will keep your feet dry when you're walking from the house to the car, but once you get to wherever you're going, you don't want to be seen in a grungy old pair of boots. You want a pair that looks good with whatever else you are wearing. Buff! menudo barrizal para meter tus botitas.